Bitbns is a new Indian cryptocurrency exchange launched in 2017 in over 50 cryptocurrencies for INR. 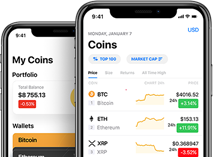 Bitbns offers its users a wallet to store their cryptocurrencies. Or they can use third-party wallets, if they so choose. Bitbns does not allow anonymous trading and requires clients to verify themselves with an ID and a PAN card in order to deposit INR. Before verifying, one can only view the price charts and order book or deposit cryptocurrencies.